If I were to name two things that have particularly drawn my attention on the streets of South East Asia it would be puppies and pyjamas, a peculiar pairing perhaps, but an amusing feature nonetheless. Stray dogs are rife in South East Asia. For the most part they seem to be happily whiling away their time sleeping on street corners, ignoring the people around them and occasionally rummaging through the litter. Some strays have been adopted by local families (or perhaps it’s the other way round?) making fantastic pets with lovely temperaments. 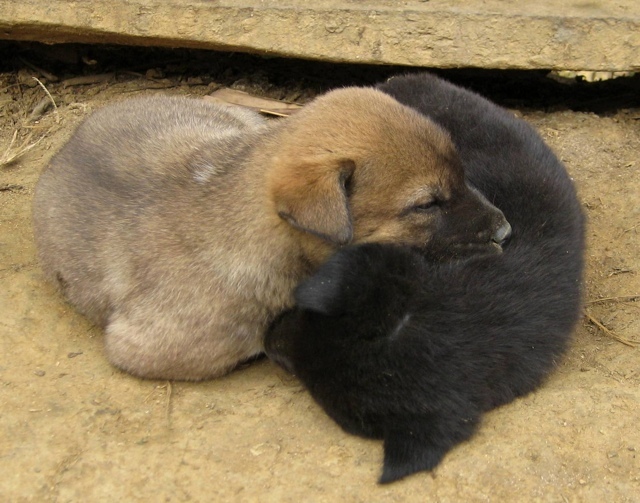 The general lack of animal welfare infrastructure means that the practice of neutering is uncommon and consequently puppies abound everywhere. We’ve had some great fun playing with incredibly cute little puppies (I think Simon is afraid one may suddenly emerge from my baggage at the airport) including one that we nicknamed Bart, as he insisted on trying to eat Simon’s shorts as we played a game of cards. Many a playful puppy has made us smile on our trip (even if Simon is laughing more at me than the puppies). almost at a loss to explain. I was once shopping in the sales when I found a lovely floral hooded cardigan, for some reason hanging up amongst the sleepwear with ‘sleep well’ printed on the label. I looked around but couldn’t spot any matching bottoms and figuring no one would know if it was a pyjama top anyway, decided to buy it. 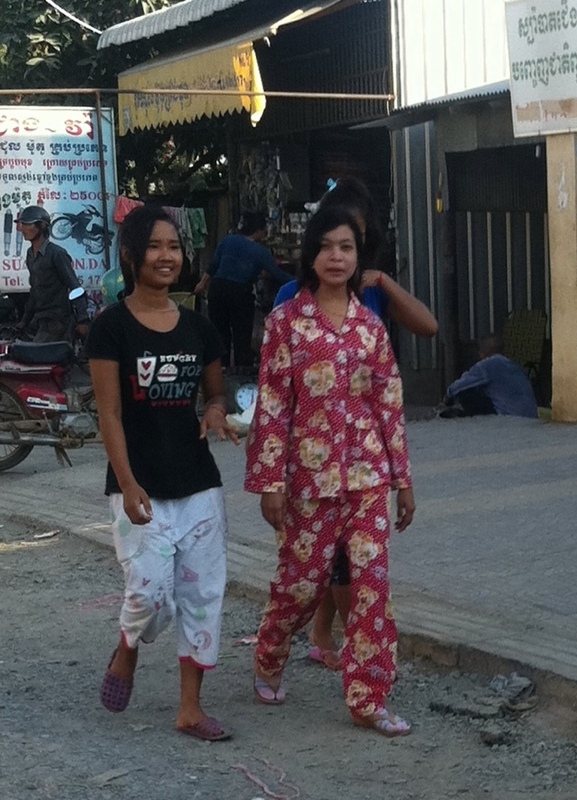 I certainly know other people who have bought nighties and worn them out as dresses, however I never expected to see so many women wandering around the streets, carrying out their daily business wearing what can only be described as pyjamas. I imagine that these ladies don’t simply decide to go out for the day dressed in their sleepwear but have simply chosen to wear something light and comfortable in the heat. However, for those of you back home who have felt the temptation to walk down to the cornershop in your PJs you can rest assured that no-one here would bat an eyelid! Whilst I can perhaps understand the wardrobe choice based on comfort, I must admit that the decision to wear matching teddy bear-patterned tops and bottoms on the streets mystifies me! This entry was posted in Cambodia, Laos, Vietnam and tagged Puppies, pyjamas by Laura. Bookmark the permalink.